Sure, we all love caprese—that Italian trio of fresh mozzarella, tomatoes and basil drizzled in the best olive oil you can find. But we can do that at home. Here, chef Joe Tripp elevates the concept by swapping in buratta (a creamy-centered fresh mozzarella), and transforming the cheese into a chawanmushi—a cool and savory Japanese custard. 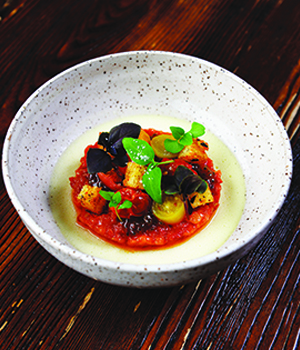 He adds heirloom cherry tomatoes that have been pickled in a blend of Japanese flavorings (white soy, yuzu juice, mirin, ginger bonito); then he weaves in some basil-seed jam to mimic the seed sacs from a slice of cherry tomato. The result? A little like discovering the beautiful inner life locked inside a friend you thought you knew so well.